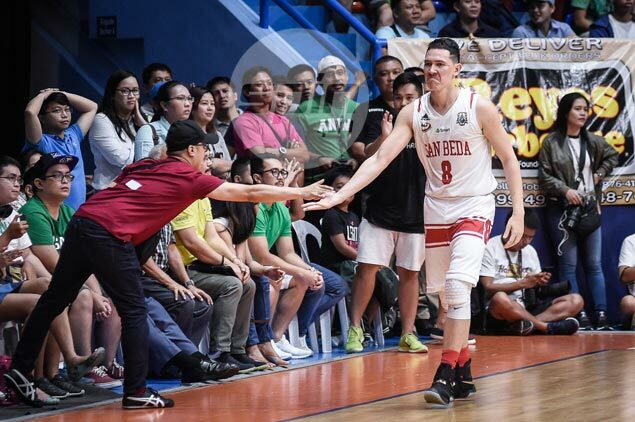 ROBERT Bolick is entering the new NCAA basketball season not only as San Beda’s new main man but, more importantly, a living testament that hard work pays off. From spending two years on the bench of UAAP powerhouse La Salle, the 6-1 combo guard has emerged as the new face of the most dominant collegiate program in the country today. It is that backstory that he hopes would inspire benchwarmers all over the land. “Yung talagang mindset ko is to inspire others. Yung mga nasa probinsya, yung bangko dito, yung mga players na feeling nila wala na silang pag-asa," the Red Lions star said. "Pag tinrabaho mo lang, may hard work, dedication, passion to play, may mararating ka,” he said. Bolick has emerged as the unlikely face of the multi-titled San Beda team, beginning in the playoffs last season when he took over in the semifinals against University of Perpetual Help, before standing toe to toe with the prolific Jiovani Jalalon and Arellano in the finals. Bolick continued his amazing rise by winning the PBA D-League MVP award with Cignal before anchoring San Beda to a sweep of the Filoil Cup preseason tournament, where he tormented the Green Archers not once but twice in games. “Wala akong masabi e. Yun na yung testament ng hard work. Masarap pakinggan yung ganun e pero siyempre yung mga di nakakaalam, hindi nila alam yung pinagdaanan ko, yung hard work, yung dedication na nilagay ko sa game,” Bolick said. Still, the 20-year old never ceases to look back on where he came from. Although he won a title with the Green Archers, Bolick’s stint with the squad from Taft was forgettable at best as he averaged just 6.8 minutes per game in his two years in the UAAP. Those years spent rotting on the La Salle bench forged the mindset that molded the 'new' Bolick. “Pag transfer ko dito, yan lang ang iniisip ko. Kailangan ko i-double yung effort ko, siyempre pag may Diyos ka, kaya mong maabot lahat. Kaya sobrang saya na naabot ko to, pero hindi ko nilalagay yan sa ulo ko na ganito na pala ako,” he continued. He will bring that same mentality to the floor against San Sebastian on Saturday at the Mall of Asia Arena, even if, for sure, he’ll be on top of every scouting report by rival teams. But the greater the pressure, the more motivated Bolick becomes. “Mas maganda yung may pressure e. Personally lang ah. Pag may pressure, pag alam nila na everyone’s gunning for your back, meaning nun magaling ka. Dapat i-double mo lang yung effort mo,” he said. “Mas gusto ko nga yung ganun kasi talagang magtatrabaho e. Walang araw na hindi tayo magtatrabaho maayos kasi lahat ng teams magaling na."